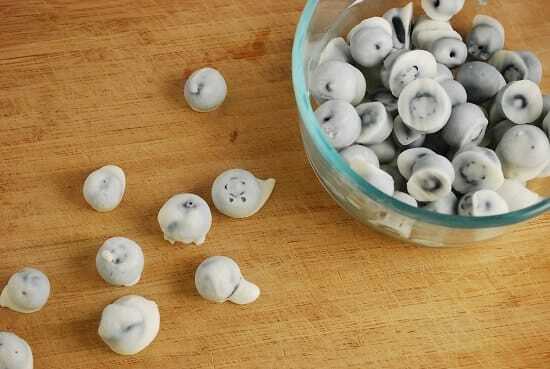 These Frozen Yogurt Covered Blueberries are such a great, healthy snack recipe idea that is perfect for a hot summer day. And it’s also a great way to use up any leftover blueberries before they go bad! At just 1 Point per serving, they make a great alternative to ice cream. The yogurt adds some sweetness to the slightly tart blueberries and the creaminess gives it a dessert like feel. These also make a great healthy snack for kids! Dipping all of the blueberries individually can be a bit tedious…I haven’t yet perfected a way to do it faster without them looking messy. But they are truly a delicious and healthy treat that is well worth the effort. Feel free to experiment and use different yogurt flavors if you like….there are lots of great flavor options available. Since blueberries are 0 Points, I only counted the yogurt, which is how I came up with 1 Point. However, if you calculate the nutritional stats of the ingredients and then enter it into your Weight Watchers Points Calculator, it comes out as 3 Points. So, armed with that info, count it however you see fit. But definitely give these Frozen Yogurt Covered Blueberries a try while blueberries are abundant in the summer months. The perfect low calorie snack recipe for a hot summer day, these Frozen Yogurt Covered Blueberries are sweet, cold and light. Full of fiber, protein and vitamins, they are as nutritious as they are delicious. Line a small baking sheet with wax paper and empty yogurt into a small bowl. Using a toothpick, dip each blueberry into the yogurt and swirl it around, shake off excess and place on baking sheet, using another tooth pick to help slide it off. Once all blueberries are coated in yogurt, place baking sheet into freezer, and let freeze for at least an hour. Try it with really small blueberries…that might make it easier. I think these look and sound awesome! I have several bags of fresh frozen blueberries that I’m assuming will be just as tasty! Can’t wait to make them…thank you for posting the recipe!!! I am aware of the “The post Frozen Yogurt Covered Blueberries – 1 Points + appeared first on LaaLoosh” that appears in the email. This is automatic link that Google adds to the email template that cannot be removed. It is used as a precautionary measure by Google. I tried to remove it from, but cannot. Sorry for the confusion! Is the “container” of blueberries a pint size container? @87b20a420c47644f0c8ce60e05f247a4:disqus where do you see that statement on this page? What source are you talking about? This is a weight watchers recipe and the photo is hers. Also, as with any other recipe, there are many of the same. No one can claim a recipe. Get your facts together before posting! I read the posts through google reader. At the end of the post it says “The post Frozen Yogurt Covered Blueberries – 1 Points + appeared first on LaaLoosh.” Actually, all of the posts say that, so maybe it’s part of the footer in the settings she has set up for the RSS feed. I get that you can have variations of recipes – who knows who created the original… I’m just saying, maybe remove that sentence, that’s all. People work hard developing recipes and it’s unfair for someone to say it “appeared first” on their blog when it clearly didn’t. Especially when this exact recipe is currently circulating on pinterest. From what I can tell, the original poster of this particular recipe is “Fluffimama” (http://fluffimama.blogspot.com/2012/03/yogurt-covered-blueberries.html). Every similar pinterest recipe points to this person as the source of recipe. I certainly can’t speak for you, but I’d imagine if you spent time and your own creativity coming up with a recipe and sharing it with others, you may feel it unfair for others to claim it as their own “original”. That’s all. Sorry if I somehow offended you.